Continue to support funding of $18.5M for a building for Georgia Northwestern Technical College for the Whitfield County campus. Support funding of $4.1M to renovate Sequoya Hall at Dalton State College. Support funding of $23M for a building for Georgia Northwestern Technical College for the Whitfield County campus. Support funding of $5M from the small cap budget for the expansion and renovation of Dalton State’s Gignilliat Memorial Hall that houses the College’s AACSB-accredited School of Business. Support for evaluation and analysis of revisions to the current QBE funding structure. Continued support of Georgia’s Performance Standards on rigor and college and career readiness. Ensure Georgia is able to grow its economy and maintain its reputation as a leader for global commerce. Support ongoing examination of the current tax base, tax rates and compliance requirements to ensure a Georgia business environment that is fair and competitive – not only for the State’s existing businesses, but also for businesses considering relocating to the State. Preserve Georgia’s employment-at-will doctrine and strengthen the state’s right-to-work status. Continue to make substantive changes to the workers’ compensation system that promotes balance for employers and employees. Continue to support, preserve and strengthen civil justice reform. Continue to improve Georgia’s infrastructure through maximizing current revenue sources and increasing funding for transportation. Statement on E-Discovery: The Georgia Bar Board of Governors voted in favor of proposed rules governing electronic discovery in litigation. 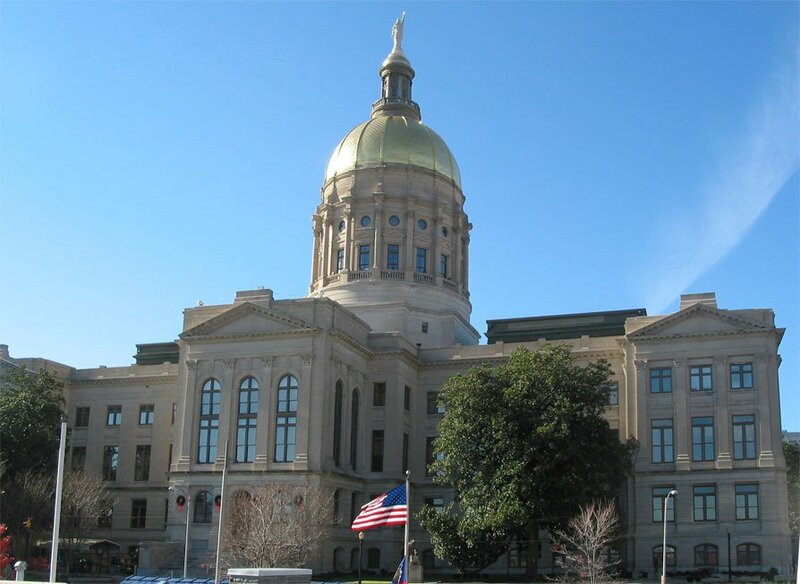 Members of the legislature are currently drafting legislation to codify the E-Discovery rules proposed by the Georgia Bar. Each day, Georgia companies collect and produce vast amounts of electrically stored information (ESI) from emails to social media communications as part of ordinary operations. As a frequent target for lawsuits, businesses must preserve and produce all electronic data requested by a plaintiff—even when remote—when a claim has been brought against them. If the producing party does not have it, the party can be severely sanctioned, including being made liable for the entire judgement even if the document was accidentally lost or mistakenly thrown away. Newly adopted federal rules have attempted to solve these problems. However, in Georgia, the State Bar proposal would depart from the federal rules and replace them with state rules that would give little guidance to companies who are preserving ESI and create more uncertainty as the new rules are tested for years in the courts. The Greater Dalton Chamber of Commerce is opposed to any legislation on E-Discovery that is detrimental to business. The Chamber recommends that Georgia support implementation of the Federal Code on E-Discovery. Note: this legislation has now been introduced on Feb. 16, 2016 and is known as HB 1017 as the Georgia Civil Practice Act. The Chamber is opposed to SB 292 and SB 293, both minimum wage bills. SB 292 removes language in state law that currently prohibits municipalities and counties from setting their own local minimum wages. SB 293 would set the state minimum wage to $15 with certain exemptions for small businesses. SB 276, known as the Georgia Personal Data Security Act or Data Breach bill, if passed, would place an incredible burden on business in trying to comply with the law. If there is a data breach, businesses would have to send individual notices (Notice of Data Breach) without delay. The Attorney General may impose civil penalties not to exceed $500 for each resident of the state who did not receive the notice and civil penalties that shall not exceed $250,000 per each breach of the security of the system. These are just a few of the examples of the burden on businesses if this bill is passed in its present form. The Chamber is opposed to SB 276. Support for SPLOST 2015, a four year 1 cent sales tax for a public safety, road improvements, and quality of life projects. Continue to support the growth of Dalton State College and Georgia Northwestern Technical College Whitfield/Murray campus. Dalton State College is growing through the expansion of student housing and this will continue to increase as the college builds new residences. Funding of $4M is requested for the small cap budget for the renovation of the Pope Student Center. Workforce development, career and technical development, and dual enrollment are all critical for not only career education, but jobs in advanced manufacturing. Funding of $23M is requested for a building for Georgia Northwestern Technical College for the Whitfield County campus and it is critical to the growth of Northwest Georgia. Support HB 277 which revises a current law that only included taxing carpet samples for binders, to now include all flooring samples. The fair market rate of 21.9 percent of the total raw material cost of the sample did not change, but the language in the bill now includes any floor covering. Support HB 766: this bill is considered the work place learning bill and it provides more flexibility for high school students to enroll in a work based learning program through their high school. It gives students the opportunity to explore career opportunities by working with employers to learn soft skills. It removes the minimum number of hours a student must be enrolled in the program, and it enables more flexibility for credit requirements to the career pathway. Support HB 714: this bill seeks to ensure uniformity in unemployment benefits qualifications for educational institutional employees statewide. Under current law, public educational institution workers are not allowed to receive unemployment benefits during the summer, holiday and other temporary breaks. However, some private companies, as third-party vendors, encourage and train their employees to file for unemployment benefits during such breaks. We also understand that employees with child care centers are also filing for unemployment benefits and this bill would ensure uniformity in these unemployment benefits. Support HB 788: this bill is an opportunity for a public private partnership with the Board of Regents for a private developer to build dorms on Regent owned land and the developer to receive an ad valorem tax exemption. Oppose SB 167 in its original form: this bill in its original form takes Georgia out of Common Core. U. S. Citizen once all requirements for citizenship are completed. The Chamber further asks that the burden of compliance for businesses large and small be reasonable and manageable. Support HB 154: the workers’ comp bill. Support HB 2: which relates to a sales tax on title fees. This legislation would allow businesses and individuals to deduct this fee on their income taxes. Support SB 73: which is known as the Anti T-SPLOST Penalty Act. Support HB 173: which proposes that up to 15% of the total proceeds collected in a SPLOST can be used for upkeep and maintenance on those projects. We also support that any ESPLOST projects can be included in this legislation. Support HB 127: which seeks to halt the now-common state practice of redirecting fees from their designated purposes to the state’s general fund for other uses. If fees for the Solid Waste Trust Fund, Hazardous Waste Trust Fund, Indigent Defense, Peace Officers and Prosecutors Training Fund and teen driver’s education are not appropriated for their intended use, the fees will be reduced or eliminated, proportionate to the amount that is redirected. The minimize the impact on the state budget, the new appropriation requirements would be phased in over four years. Support HB 357 and SB 176: In 2009, Georgia passed the Voluntary Remediation Program (VRP) as a public/private partnership program to clean up hazardous sites. This legislation makes significant revisions to the VRP, allowing it to be used for HSRA, Brownfields and RCRA sites as well. It also changes cost recovery mechanisms for contaminated ground water cleanup; strengthens credential requirements of those implementing a VRP corrective action; streamlines/reduces the VRP application and reporting provisions; alters how restrictive covenants are used by the EPD Director; limits liability for some property owners; allows the option of basing groundwater cleanup on current and reasonably foreseeable future use; alters liability for land purchasers who apply within 30 days after closing; and allows Georgia citizens the right of appeal under HSRA, among other provisions. Oppose HB 225. Current law provides that the General Assembly can stay and override rules and regulations of the Georgia Environmental Protection Division (EPD), except in cases where EPD is following federal directives as part of its delegated powers. HB 225 would require that the General Assembly first approve any EPD rules and regulations before they can take effect. Economic Development: improve Georgia’s economic competitiveness by looking at all economic development opportunities, investment, job creation, and recruitment tools. Employment at Will Doctrine: continue to strength the employment at will doctrine. Right to Work State: continue to support Georgia as a Right to Work State. Unfunded mandates: continue to oppose unfunded mandates that increase costs to business and to local governments. Savannah Ports: support the expansion efforts of the Savannah Ports to improve Georgia’s economic development competitiveness. Reform the tax code: continue to look at reforming Georgia’s tax code to be more competitive with our surrounding states, which will improve Georgia’s economic competitiveness and to improve transparency and equity of the code for all Georgia citizens. Workforce Development: continue to support efforts that improve workforce development such as adequate resources for technical colleges of Georgia. The Greater Dalton Chamber of Commerce Executive Board studied the impact of Constitutional Amendment #1 regarding Charter Schools that is on the General Election Ballot for November 6, 2012. As a result, the Board took a position to oppose this Amendment and to inform the voters about the impact this Amendment will have on our local school districts. They also took the position to encourage voters to Vote No on this ballot initiative because the language on the ballot is misleading. The Greater Dalton Chamber of Commerce and both school districts (Dalton and Whitfield County) support charter schools that are approved at the local level by local boards of education. This amendment has nothing to do with charter schools, but rather it creates another layer of State Government that authorizes the creation of an appointed commission that will cost the State and taxpayers over $1 million a year to operate. Local Boards of Education can already authorize charter schools and will continue to be able to do so regardless of whether this amendment passes. The State Board of Education can already authorize charter schools. It serves as a place where those denied locally can appeal. This won’t change regardless of whether the amendment passes. Public education and our local school districts have experienced tremendous cuts in education over the last few years due to State wide budget cuts. This issue seems to be about taking away local control from the local Boards of Education and giving this control to the State appointed commission. It also seems to be about shifting State education funding from public education to State commission appointed charter schools. There is concern that the State appointed commission will create new and costly State bureaucracy that will provide no accountability to local citizens, omit parent involvement, and create financial inequities. The Greater Dalton Chamber of Commerce encourages voters to understand the issue, the impact to the local school districts and to Vote No on Constitutional Amendment #1 relating to Charter Schools. 2012 Primary Election Ballot: The Chamber supports a ballot initiative/referendum for education improvements to both school districts; Dalton Public Schools and Whitfield County Schools for a 1% local option sales tax for five years. For the past few years, the Greater Dalton Chamber of Commerce has been advocating the elimination of the sales tax exemption on energy used in manufacturing. The elimination of the sales tax would make Georgia more economically competitive, help attract new investment and encourage job creation. The Georgia General Assembly passed H. B. 386 in 2012, which included the elimination of the sales tax on energy used in manufacturing, mining and agriculture over four years. The Legislative Action Committee has studied the facts regarding the Transportation Act of 2010 and they have recommended the Chamber take a neutral position and post the fact sheet for voters to review. This recommendation was accepted by the Greater Dalton Chamber of Commerce Executive Board on March 29, 2012. Uncertainty and regulation are key factors affecting the recovery of the economy from energy policy to taxes. The positions listed below impact our manufacturing community. NLRB: National Labor Relations Board: support Congressional review Act SJ Res 36 and HJ Res 103 that disapprove of NLRB’s new election rules and prevent the NLRB from moving forward with the new rules governing union elections. Taxes – certainty in the tax policy is critical. Businesses have difficulty planning and growing economically when there are one or two year extensions of the current tax policy. Support tax reform. Energy – support for the creation of a comprehensive, national energy strategy that embraces an “all of the above” approach to energy policy creating dependable power that’s critical to manufacturing. Oppose state, regional and federal regulatory efforts to regulate greenhouse gas emissions. The Special Joint Committee on Georgia Revenue Structure will vote on a tax reform proposal containing recommendations made by the Special Council on Tax Reform and Fairness for Georgians. The Chamber supports the current proposal as it will reduce tax rates for all Georgians, increase our state’s competitiveness, and stimulate job creation. Lowers the personal income tax rate, helping the majority of small businesses across the State who pay taxes at this rate by allowing them to invest more in job creation and business growth. Helps Georgia manufacturing companies by eliminating the sales tax on energy, removing a key competitive barrier and retaining and attracting more jobs.This proposal does not include a sales tax on groceries, increase the cigarette tax or taxes on non-profits, or eliminate the senior income tax exemption. Support SB 17, which creates a State Commission to review proposed and existing health insurance mandates. of 35% is scheduled to increase to 100% on a Jan. 1, 2012, and this bill would cap the increase at 50%. Support HB 86, which eliminates the sales tax on energy used in manufacturing. Local Issue: 2011 General Election Ballot. The Chamber supports a ballot initiative authorizing Whitfield County to exercise redevelopment powers under the Redevelopment Powers Law.